In both schools, the Digital Collection Day was held in a large room booked out for this event (the library and the school hall/theatre respectively). The rooms were a good size, quite near an entrance that could be managed, and had space not just for the Collection Day activities but also to host other activities, such as the Frontline Living History exhibition (see below). 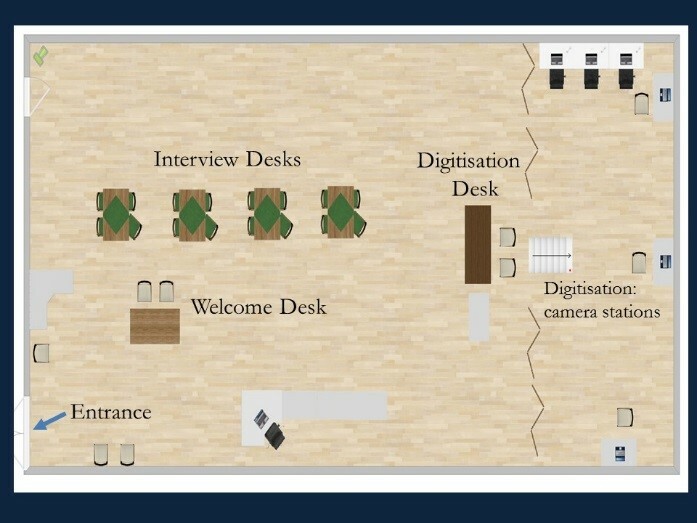 A Digital Collection Day could also be run in other types of venues, for example a series of smaller rooms, as long as it is possible to smoothly move visitors and objects between different stations: welcome desk and waiting area, interview, and digitisation. Advertising to the local community through local radio, newspapers, posters in libraries, and on social media, etc., telling people to bring items along, time and place, and the purpose of the event. Both schools had elected for the collection day to be open to members of the public and had worked out the logistics in terms of signing in and overseeing members of the public just walking in. Both schools decided to run Collection Days that were open to the public in the afternoon (1-4pm) but in the morning had Frontline Living History giving talks to relevant classes/years (see below). On the Collection Day, the teachers ensured the venue was set up as required with tables, chairs, signage, etc. in place. 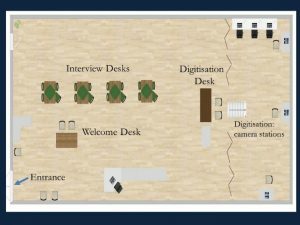 As both schools were local to Oxford, the Lest We Forget team provided and set up the digitization area, complete with cameras, lights, and scanner. Before the event, teachers had divided students into their assigned groups: 2 for the welcome desk and as many as available to look after teh visitors and make sure they knew where to go and when, 4 or 5 pairs of students for the interviewing desks —this allowed one student to ask the questions, while the other made notes about what was being said—and 3-4 pairs of students for digitization. Where there were more student volunteers, students worked in shifts or took on additional duties, like guiding visitors around the event. The older sixth form students were on hand near each station, ready to provide additional help if things got busy. Throughout the event, teachers generally oversaw the main areas, ready to answers any questions. They also monitored the timely flow of the event, ensuring that people who had brought in objects where not waiting long at each stage. Frontline Living History offers workshops, taks and artefact handling sessions related to WW1. Both schools decided to combine their Collection Day with talks and demonstrations by Frontline. who held workshops around battlefield medicine and other topics, complete with a variety of related WW1 objects and replicas for students to handle and/or try on. The talks, and the opportunity to view and handle a variety of WW1 objects, were much appreciated by both students and teachers. During the event, Frontline then set up a large table for members of the public (and students) to view a diverse collection of WW1 material; they also advised on the material brought in by the public and demonstrated equipment and kit used in the war. What was the most interesting artefact you encountered on the day? What did you most enjoy about taking part in the event? I enjoyed hearing the types of family stories that I have never heard before. It was interesting hearing different sides of the war. ‘Lest We Forget‘ is a nationwide initiative, led by the University of Oxford, which aims to recognise and record those stories, objects and memories from World War One which survive – not in museum collections or history books – but in the hearts and homes of the very many families and individuals affected. The project can provide practical support to local communities interested in running their own Digital Collection Days. Individuals can also upload material directly via the project’s online platform. If you would like to know more about holding a Digital Collection Day in a school or other local community, please visit https://lwf.web.ox.ac.uk or contact the project at ww1collections@it.ox.ac.uk.